The BOE is a division of the Superior Court Clerk and is comprised of three members who own property and live in Cobb County. They are appointed by the Grand Jury and take an Oath of Office to faithfully and impartially discharge the duties involved in hearing appeals and rendering a decision. Why would I appeal to the BOE? Taxpayers who feel that their Fair Market Value is not accurate may appear before the Board of Equalization to present evidence supporting their position. Appeals are processed through the Tax Assessor’s Office. The board can also hear cases on Taxability, Uniformity, and denial of Exemptions. You must file with the Tax Assessor’s Office within 45 days of the mailing of your Annual Notice of Assessment. After review by the Tax Assessor’s Office, the assessed value is either changed or not changed. 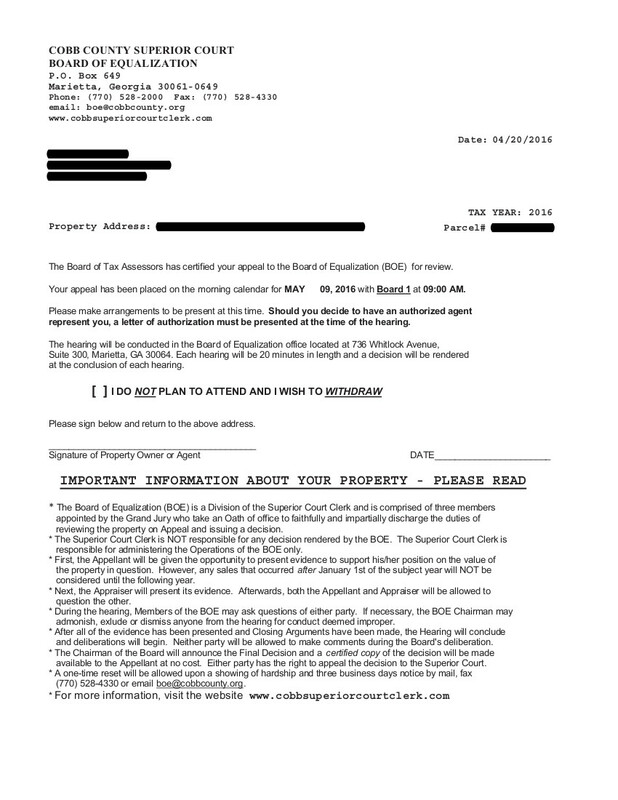 No Change – Your appeal is automatically forwarded to the BOE to be scheduled for a hearing. Change in Value – You will receive a “Value Change Notice” stating the change in value from the Tax Assessor’s Office. You will have the option to appeal to the BOE within 30 days after the date of the notice if you disagree with the new value. How will I be notified about a hearing date? Failure to receive the scheduling letter is not grounds for rescheduling. 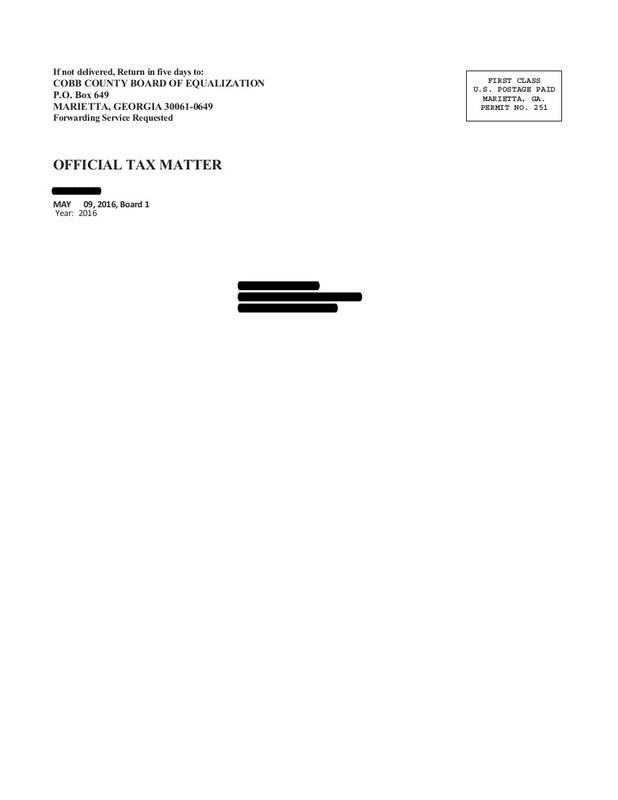 We use the address supplied by the Tax Assessor’s Office. It is your responsibility to ensure that your mailing address is correct when you file your appeal. A one-time reschedule will be allowed upon a showing of hardship and three business days notice by email to boe@cobbcounty.org. What should I expect at a BOE hearing? There will be 3 members of the board present and a representative from the Tax Assessor’s Office. You will both be given an opportunity to present evidence supporting your position. The “burden of proof” lies with the Tax Assessor’s office except in cases of “exemptions”. Board members are required to hear both the appellant and the representative of the Tax Assessor’s Office and make an objective, unbiased decision based on the law and evidence presented. A decision will be rendered at the end of the hearing. Failure to appear for a hearing will result in “No Change in Value”. A decision letter will be certified mailed to you. Prior to the hearing, it is suggested that the property owner take advantage of discussing the data about the physical characteristics of the property with the person in the Tax Assessor’s Office who is administratively responsible for the handling of this appeal. The Tax Assessor has the burden of proving its opinion of value by a preponderance of the evidence. In order for the property owner to successfully appeal the determination of the County Board of Tax Assessors, it will be to their great advantage to be prepared to present at least an opinion of value and some support for that opinion of value at the time of the hearing. The Board will give the property owner the option of presenting his or her information firms. Both parties will be afforded an opportunity to present information without interruption. After the initial presentation, both parties will be given a chance to cross-examine, rebut, or question the other party’s information. The Chairperson shall control and conduct the hearing, and may reprimand, exclude, or dismiss any person from the hearing because of improper conduct or other circumstance. The law allows for a pre-settlement prior to the hearing. The board does not investigate or research, but simply listens to information presented and makes a decision based on the information presented by both parties. Therefore, you cannot expect the Board to do anything for you that you do not bring to the table yourself. The Board is not a watchdog. It is a neutral and independent entity that is charged by law to base its decision on the best information presented to the Board. Pictures of property, if needed. If you are to be represented by a Tax Rep, Attorney, or some other party not listed as an owner of that property, you must supply an assigned Letter of Authorization. It must show your parcel ID#, your name, and the name of the person representing you. Value – What the property would sell for in a transaction between a knowledgeable buyer and a willing seller in a bona fide, arm’s length transaction (O.C.G.A. §48-5-2). Denial of Homestead Exemptions – Does the property qualify for homestead exemption? (Georgia law provides for statewide exemptions (O.C.G.A. §48-5-44 through §54). There may also be local exemptions available. (For more information, contact the county Tax Commissioner.) The burden of proof lies with the appellant during these proceedings. Denial of Special Assessment – Georgia law provides for special assessments of certain types of property such as property used for agricultural purposes (conservation use, agricultural preferential, Forest Land Protection Act of 2008), rehabilitated and landmark historic properties, contaminated property (also known as Brownfield), certain environmentally sensitive property and stormwater/wetlands. (For more information on these, contact the county appraisal staff or Tax Commissioner.) If an application for one of these special assessments has been denied or a breach of the existing covenant has been denied by the Board of Tax Assessors, this action may be appealed. The burden of proof lies with the appellant during these proceedings.